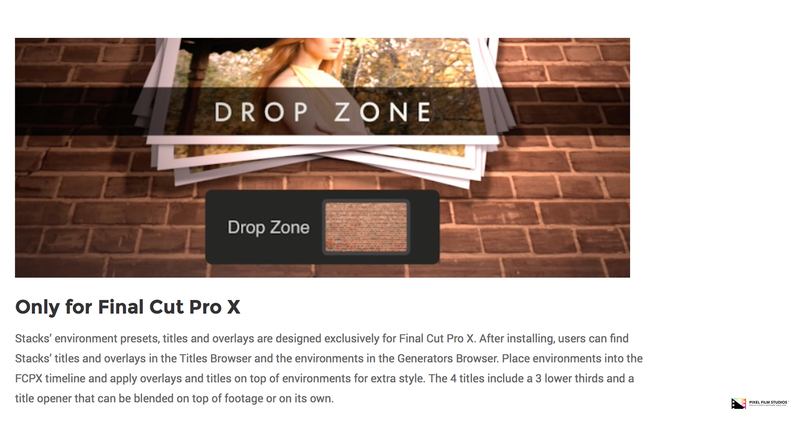 "Stack allows users to stack photo frames on top of one another as the drop zone media plays continuously throughout making the editing process easier for FCPX users," said Christina Austin - CEO of Pixel Film Studios. 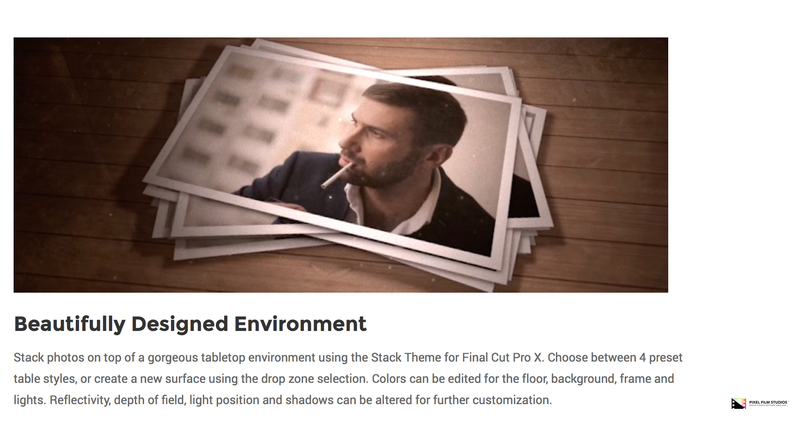 Stack photos on top of a gorgeous tabletop environment using the Stack Theme for Final Cut Pro X. Choose between 4 preset table styles, or create a new surface using the drop zone selection. Colors can be edited for the floor, background, frame and lights. Reflectivity, depth of field, light position and shadows can be altered for further customization. Stacks’ awesome drop zone animation is also fully customizable. 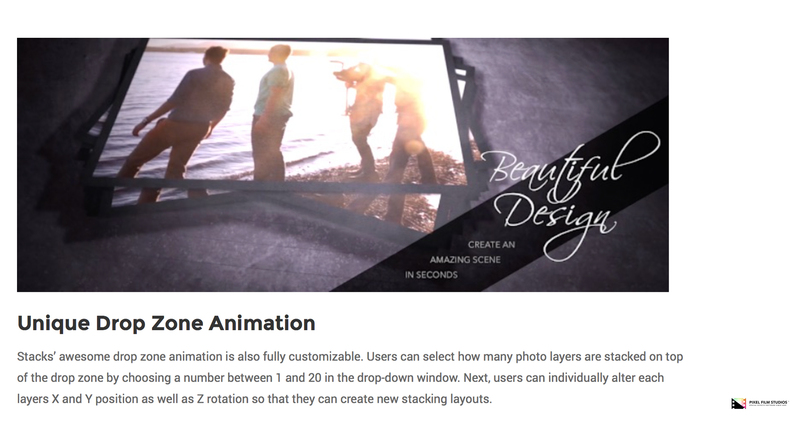 Users can select how many photo layers are stacked on top of the drop zone by choosing a number between 1 and 20 in the drop-down window. Next, users can individually alter each layers X and Y position as well as Z rotation so that they can create new stacking layouts. Place an overlay on top of the environment, or personal footage to add an extra layer of stylization. Choose between textures like the grunge, watercolor scratch and vintage looks, or particles like the dust overlay. Each overlay has its own set of controls so that they can be customized to meet a variety of different looks. 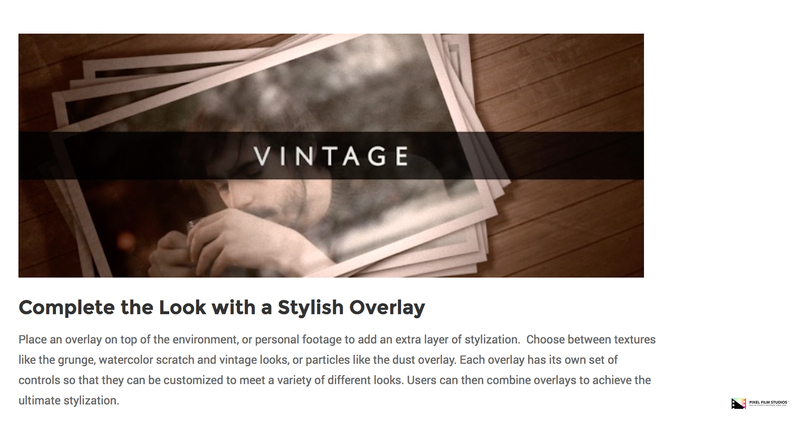 Users can then combine overlays to achieve the ultimate stylization. 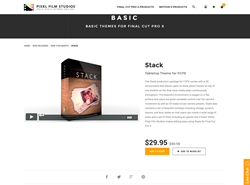 Stacks’ environment presets, titles and overlays are designed exclusively for Final Cut Pro X. After installing, users can find Stacks’ titles and overlays in the Titles Browser and the environments in the Generators Browser. Place environments into the FCPX timeline and apply overlays and titles on top of environments for extra style. The 4 titles include a 3 lower thirds and a title opener that can be blended on top of footage or on its own.